Orlando seems to be a restaurant mecca. Do you want sit-down or counter service? High-end or gastropub? We’ve got it all. Every imaginable type of eatery exists here, from sandwiches, salads, and steaks, to ice cream, cookies and shakes. That line might sound like it’s straight outta Whoville, but the underlying thought is true. O-Town is food heaven. 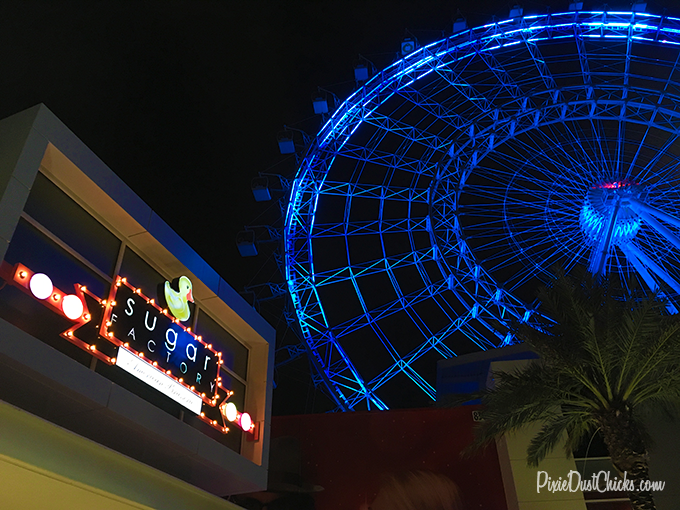 So it’s no surprise that The Sugar Factory, a brand new restaurant adjacent to The Orlando Eye, has just opened it’s doors on International Drive! Our first trip here (as a family of 4) was during their opening week. Walking in we found ourselves in what looked like a brightly lit candy store/ice cream shop. Want to guess what happened next? Total distraction! Souvenir mugs and assorted candy bins lined three of the walls while the fourth wall held a freezer of ice cream and employees willing to serve, but we were dazzled by the bright colors. True story. 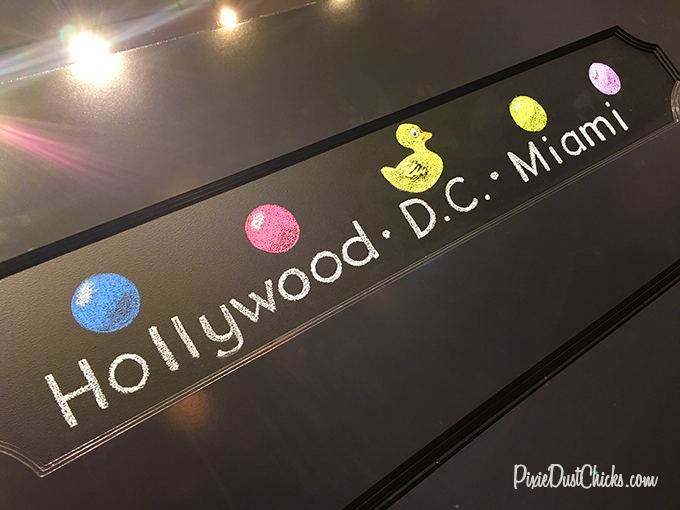 …which was a gorgeous addition to the room! Isn’t that beautiful?! Glancing at the thick menu we could tell that this was more than your typical place to grab a bite. In fact, the first 8 pages or so of the menu are devoted to only drinks! Their signature drink, the Goblet, holds 60 ounces of liquid according to the menu. This comes in many different flavors, can be made non-alcoholic, and comes with candy in the drink. But the best part is yet to come! We ordered the Very Berry Goblet as non-alcoholic. Our fantastic server, Miranda, brought out this huge round glass full of ice and set it on our table. Then, she grabbed a tall, metal tumbler and proceeded to pour a pretty red liquid over the ice in the Goblet. Watch the video to see what happened! Wasn’t that cool?? We’re pretty easily enamored with new experiences, so we were staring and poking at our giant drink for a bit before we actually tasted it. 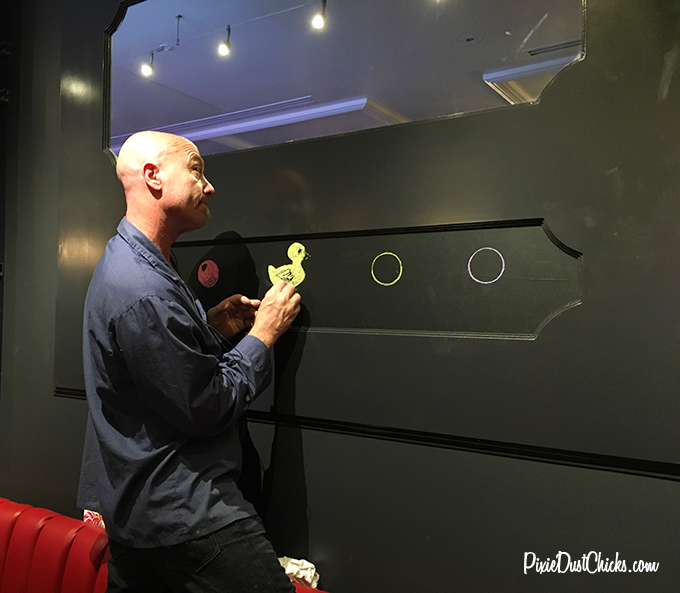 (Yep, we’re like little kids that way.) But wow, was this the perfect choice for us! It tasted like, oh, well, sparkly sweet liquid berries! And let’s not forget the chewy berry candy that was also in our drink. Double prizes! But hang on…the Goblet is just the tip of the iceberg. The following pages of this extensive menu contained pictures and descriptions of more drinks (all with the option for no alcohol), including another option we had to try: The S’mores Martini. Yes, the rim of this decadent looking drink is dipped in graham cracker crumbs. And don’t you love how they garnished the marshmallows with some cocoa powder? Since one of us is slightly under 21, and one of us is slightly over 21, you can figure out who enjoyed this tasty treat. So in case you think it’s all liquid refreshment here, fear not. While we were enjoying our drinks we also had the Sampler Platter which includes onion rings, chicken tenders, buffalo wings and mac & cheese pops, all with dipping sauces. Everything was delicious, but the Tomato Bacon jam, a thick sauce for the mac & cheese pops, was especially good. 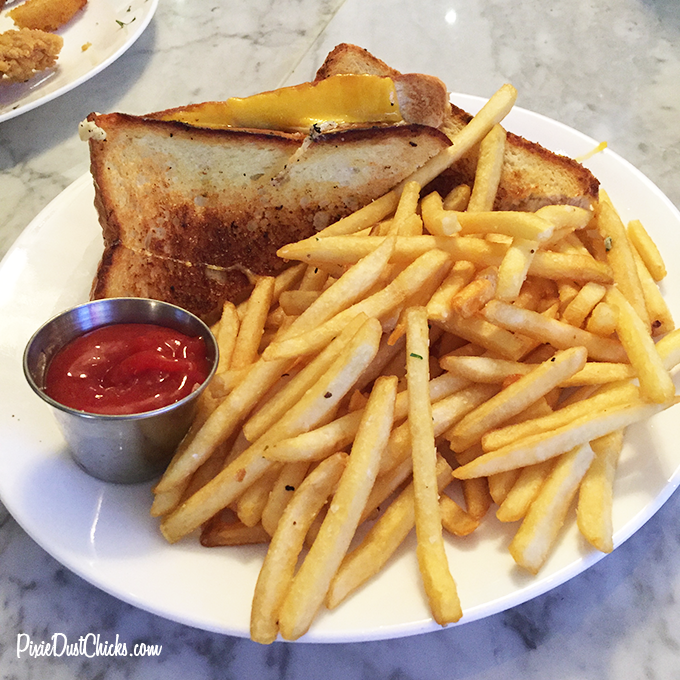 We also tried the 4-Cheese Grilled Cheese Sandwich, another good dish. The menu also has just about everything under the sun as far as lunch and dinner choices. 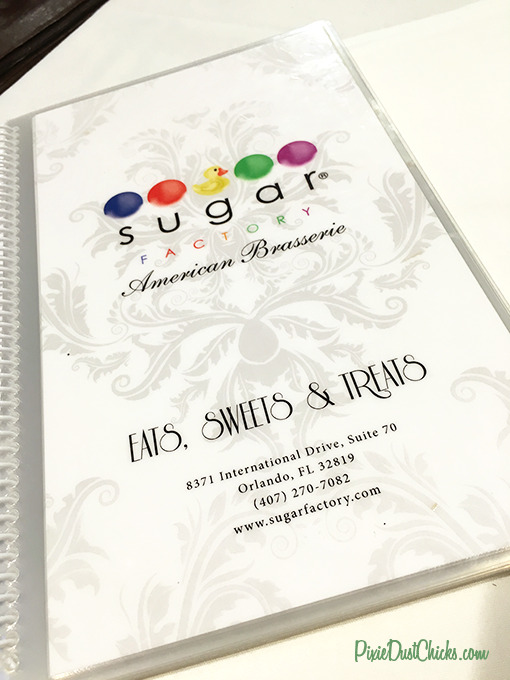 Plus, The Sugar Factory serves pancakes, waffles, french toast and crepes all day and with their own sweet twist added in. Since we were headed to see Star Wars: The Force Awakens for the 2nd time (and were running late), we made the difficult decision to stop eating after this and skip dessert. Okay, we know what you’re thinking…”How can these two chicks skip dessert?? They live on sweets! !” And you’re exactly right, so kudos for knowing us so well! (Yes, we know some of you remember that hilarious beignet incident on one of our Scopes a while back. Powdered sugar. ‘Nuff said.) 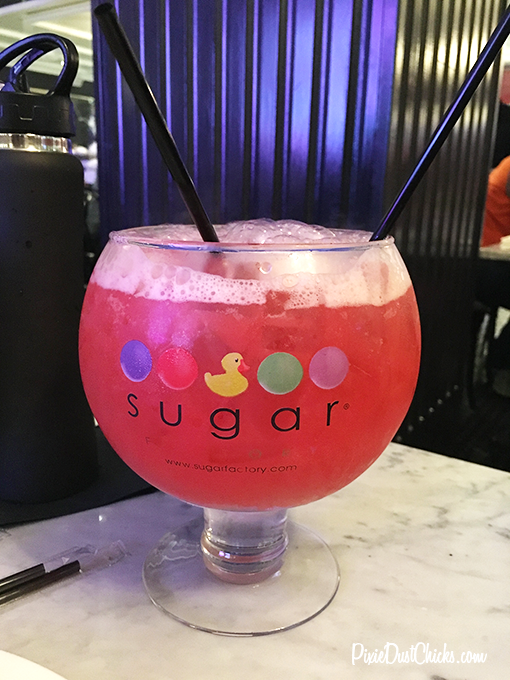 But we really want to enjoy a full dessert experience here at The Sugar Factory, so we’ll save that for another post. Besides, that one will be epic. Beyond epic, even. 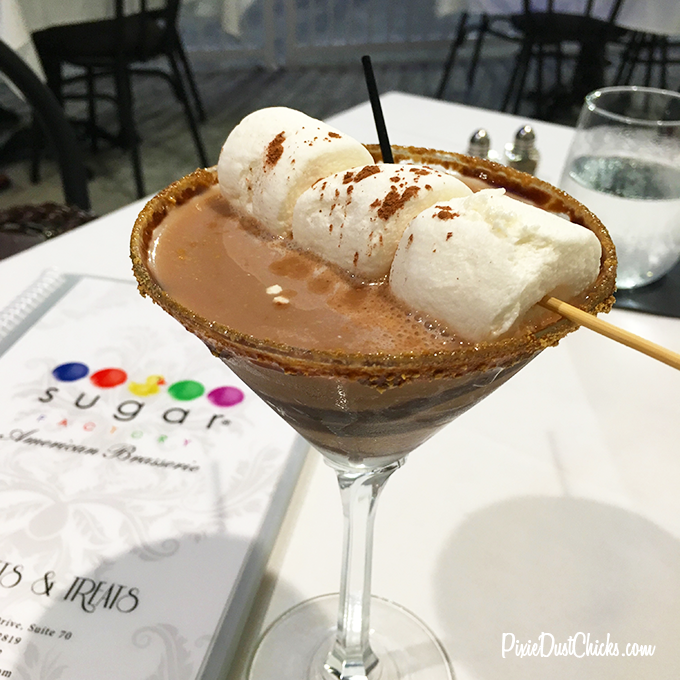 Did we mention that they have menu pages of sundae’s, milkshakes and a whole layout dedicated to chocolate fondue? Yep, you’ll thank us later. 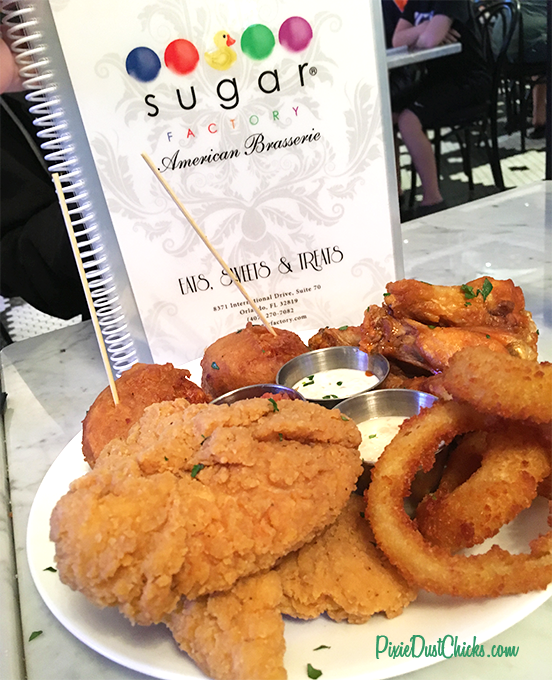 Overall, we enjoyed our visit to The Sugar Factory! Next time, though, we’re going strictly for dessert. Can you blame us?! Ohhhh! That chocolate martini looks GOOD!